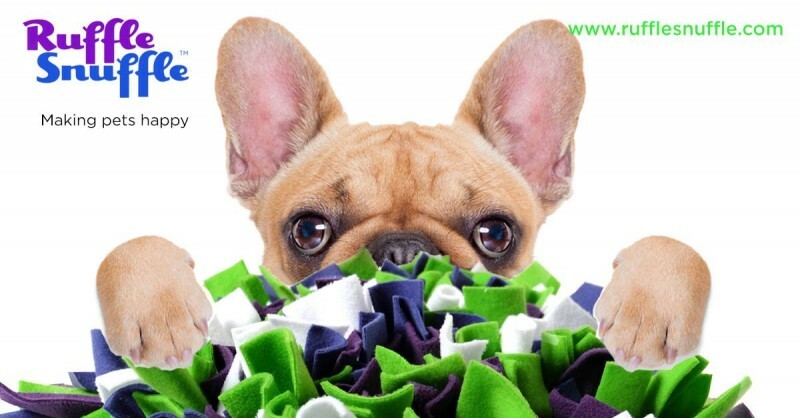 The Ruffle Snuffle mat is an enrichment activity designed to use your dogs greatest sense, their nose. 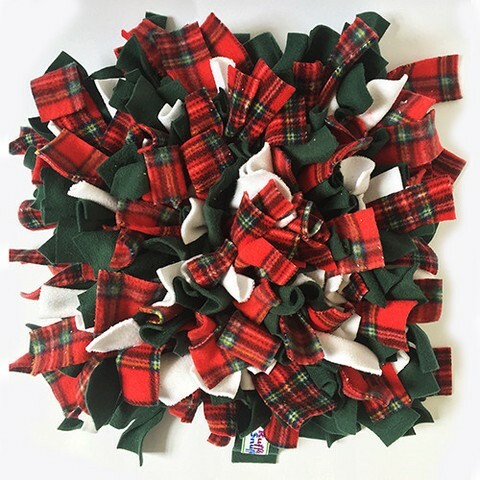 Animals love to snuffle for food and treats and the Ruffle Snuffle™ rug has lots of soft fleecy folds which are perfect for noses of all shapes and sizes. The hunt for food provides excellent physical and mental stimulation as well as giving you a chance to play ‘hide and seek’ with your cat, dog, guinea pig or even horse. 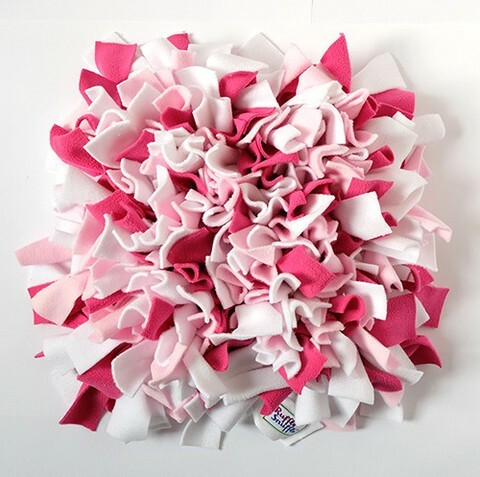 A Ruffle Snuffle™ rug is perfect for slowing down fast eaters. Just sprinkle their dried food on to the rug and ruffle it into the fabric. Your pet will love searching for their dinner! (They can hold up to 400gm of dried food). It is ideal for pets on cage or box rest after an illness or injury providing enrichment in their confined space. 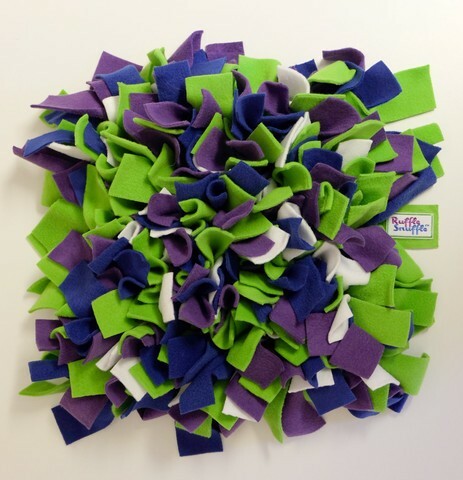 Ruffle Snuffle™ rugs are made from high quality super luxury fleece and heavy-duty recycled rubber matting. They are long lasting, high quality and portable. 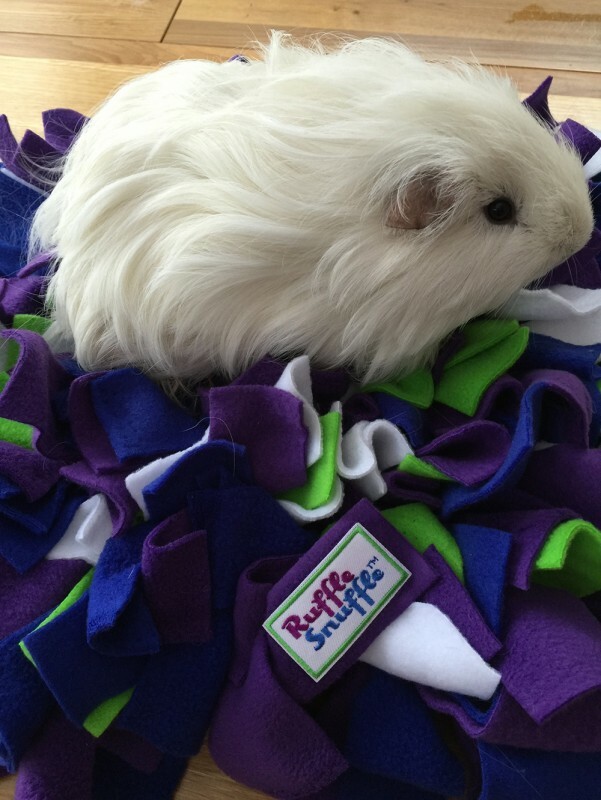 Your Ruffle Snuffle™ rug can be washed at up to 30 degrees to keep it fresh and slobber-free. The London Collection -Red, White & Blue collection of union jack themed products. They have infused the fleece with catnip to make it irresistible to your pussycats and keep them purring for ages. 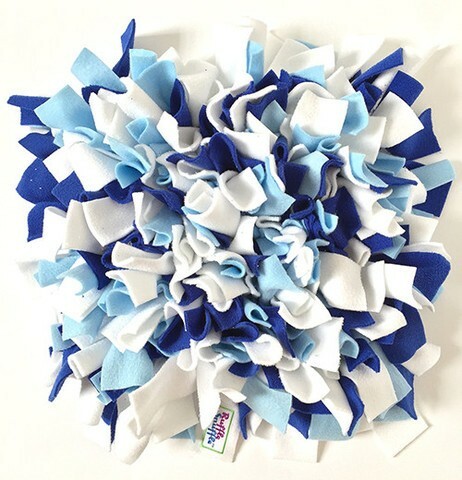 Long lasting, high quality and portable the Ruffle Snuffle™ Meow mat can be washed at up to 20 degrees to keep it fresh. All fleece and machine washable. Choose your activities and we'll combine them into a custom nose work mat. Delivery times currently 7-10 days. Parcels are sent by Royal Mail Tracked 48. Delivery charge £5.95 to the UK. 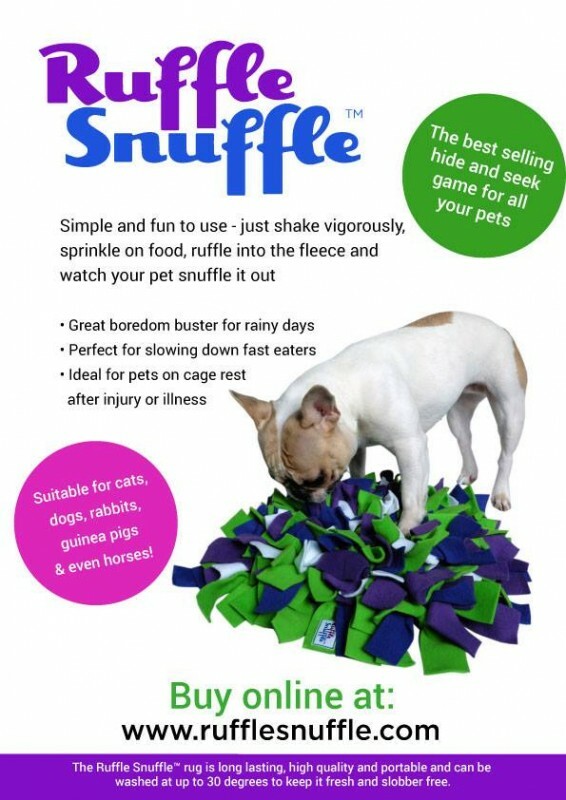 Ruffle Snuffle® was created by me, Sarah White, an animal behaviourist and trainer, who uses positive reinforcement methods to train and enrich animals' lives. I am an Animal Behaviourist and design enrichment toys for pets. Ruffle Snuffle® does not make snuffle mats for anyone else nor endorse any other snuffle mat products you may see anywhere else for sale. If it doesn’t have “Ruffle Snuffle®” on it, then it’s not an original snuffle mat designed and tested by me. Each Ruffle Snuffle® rug is lovingly hand made in Britain. My small team of snufflemat makers work very hard (and drink lots of tea) making sure each Ruffle Snuffle® is just perfect. 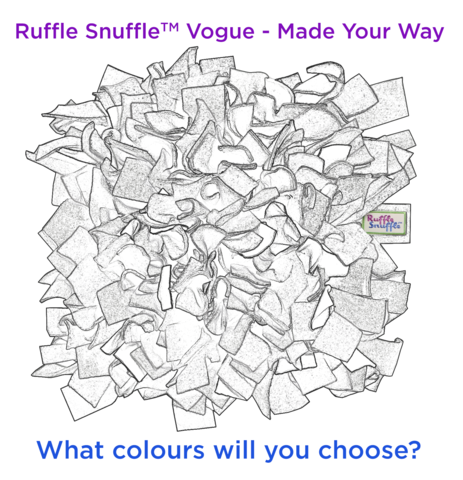 Delivery times for Ruffle Snuffle vary depending on our order volumes, but please allow up to 14 days for yours to be made and delivered. Standard delivery is Royal Mail Tracked and we charge post and packing at £5.75 Express delivery is available to the UK - please allow 2-3 days for us to make and ship your order. You will receive a shipping notification when it's on its way. We bought Henry a Ruffle Snuffle for Christmas and he loves it! It was made in colours to match our living room, and the quality is second to none. It was beautifully made and packaged, and arrived in good time. We keep it out of Henry's reach until it's time to play, then he waits patiently for the treats to be hidden before snuffling for England! 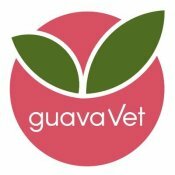 I would highly recommend this product, and Ruffle Snuffle as a company, customer service at its best which is so important these days. We bought a Tuggers Twist last Christmas. It's a favourite with our two Great Danes, they 'rag' it, play tug of war with it, chew it and are usually carrying it around the house or garden. It goes into the washing machine at least once a week - and it still comes out as new! It has passed the 'Dane' test and it's still going strong! We received the new Cat Candy Toy with speedy delivery and protective packaging. Love the colours of the cat candy, not too over bearing for the average home and looks great! The ribbons add an extra touch and are great for swinging/spinning it around for our indoor cat to chase and attack! The bell inside is light and quiet, it doesn't cause any annoyance to use, even when Hugo is batting the Cat Candy around while we watch TV! 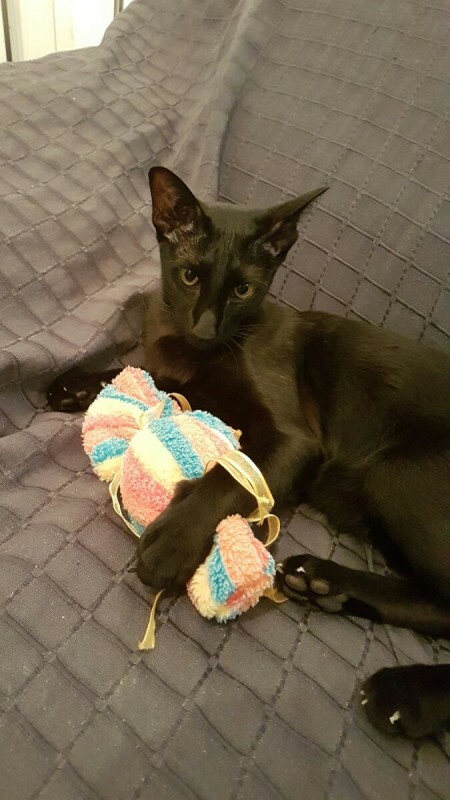 As Hugo has always played fetch, the Cat Candy is great for playing his favourite game. It is light, but it carries enough weight for you to throw it around for the cat to chase. Safe to say. we're on to a winner with this one! Delivery of our snuffle mat was very quick, it was a lot bigger than I expected it to be. My immediate response was Wow!.... Welly couldn't wait to investigate what it was! He absolutely loves it....... we even have a special rufflesnuffle time in the afternoons..... He loves snuffling, looking for treats... keeps him occupied for ages, even if there are no treats in it. Great product to keep them busy if you have to pop out or just get on with stuff. Just want to say what a fantastic product..... Welly really does love his ruffle snuffle. We even have a special ruffle snuffle time...... Fantastic quality and value, kept him occupied for ages. He even likes to play with it even if there is no treats hiding! He runs over to it then looks at me to get the treats out!... We highly recommend this product for all doggies out there. Great for occupying them if you need to pop out or just get on with stuff for a while. Welly gives it a 5 paws that's for sure. 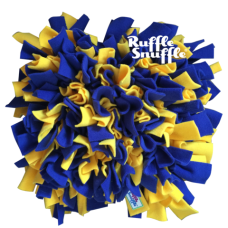 We received our Ruffle Snuffle last week, the delivery was quick and it was so much bigger than I thought it was going to be, it was an instant hit with our dog and he even pulled it out the box himself, he was so excited! It's tough and sturdy, we find it great for hiding treats in and we've even used it for hiding kibble dinner in as a slow down tool, it worked great and there was waggy tails all round! Thinking of getting the cat Ruffle Snfuffle next!